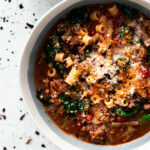 A hearty weeknight dinner, this Italian Sausage Soup with Spinach, Pasta, and Caramelized Fennel fills any home with the spicy-sweet scents of a meal worth savoring. Mild Italian sausage mingles with leeks and fennel caramelized to sweet perfection, then slow-simmers in a tomato-laden broth before finishing with petite ditalini pasta and fresh baby spinach. Topped with fresh grated Parmesan, this Italian sausage soup comes together in under an hour, perfect for any night of the week! In a large Dutch oven over medium-high heat, add 1 tablespoon olive oil, followed by the Italian sausage. Cook until browned, breaking the meat up as it cooks, around 5 minutes. Remove the sausage with a slotted spoon and set aside, leaving behind the juices in the pot. Reduce heat to medium and add remaining olive oil, followed by the fennel and leek. Saute, stirring occasionally, until fennel is softened, about 5 minutes. Add the garlic and cook until fragrant, around 1 minute. Add the white wine and cook until mostly evaporated, about 1-2 minutes. Increase heat to medium-high and continue cooking until fennel and leek are browned and caramelized, 3-4 minutes more. Add the tomato paste and crushed red pepper and saute until fragrant, 2 minutes. Season with salt and pepper as desired. Add chicken stock, diced tomatoes, and the cooked sausage. Stir gently and bring the pot to a boil. Reduce heat to medium and simmer for 10 minutes. Stir in the ditalini pasta and cook for an additional 8 minutes. Stir in the spinach and let wilt for 1-2 minutes. Adjust seasoning as needed, then ladle hot soup into bowls and top with grated parmesan. Enjoy hot. *to prepare the leek, cut away the dark green leaves and bottom root, then cut in the half lengthwise. Slice 1/4" half moons and add to a bowl of cold water to remove any dirt. After a couple minutes, remove leek from water with a slotted spoon and gently dry with paper towels.